Prevent Back Injury with These Transferring Tips from Hired Hands. Need Help Transferring a Senior from a Bed to a Wheelchair? Prevent Back Injury with These Tips. The odds are certainly not in our favor: more than half of all caregivers are incurring injuries as a result of lifting or transferring an older adult. 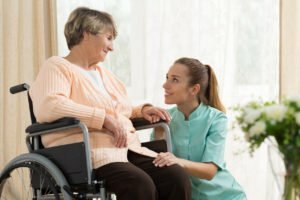 With so many family members providing care for senior loved ones, it’s imperative for them to learn proper lifting and transferring techniques, and Hired Hands Homecare, providing home care in Sonoma and the surrounding areas, is happy to share the following, which can both prevent back injury for a caregiver and protect the older adult from injury as well. Place one foot on a footstool beside the bed (if the bed is low) to relieve pressure on your lower back. Place the wheelchair as close as possible to the bed and perform a quick safety check on the wheelchair’s position. Make sure the brakes are locked and both armrests and footrests are swung out of the way. Tell the older adult what you are going to do and let him look to where he is going to be transferred. Before beginning to move the person, count out loud: “1-2-3”. If the senior is able, have him place his hands on the bed to help with the transfer. For best support, stand close to the senior you are lifting. Bend your legs at the knees rather than the waist, keeping your back and neck in a straight line with your weight balanced on both feet. Tighten your back and stomach muscles to maintain a strong and correct support position. Use your arms to support the senior and your legs for lifting. Turn on one foot to pivot, instead of twisting your body. Using a transfer belt around the older adult’s waist can provide an extra measure of stability and support as you complete the transfer. Advise the older adult to hold the wheelchair armrests for support (if he is able). If you still find it a challenge to safely help your senior loved one move from bed to a chair or wheelchair, Hired Hands Homecare is here to help. Our Sonoma home care team is fully trained on lifting and transferring older adults, and helping them fully engage in as active a lifestyle as possible. Whether it’s just a little respite care needed, or full-time, around-the-clock care, take steps to prevent back injury to yourself or any potential harm to your loved one by calling us at (866) 940-4343 for assistance.